There are many reasons to learn Hebrew such as to read the Tenach (the Old Testament of the Bible written in Hebrew) in its original language or simply to learn how to pronounce Hebrew words such as those in Strong's Concordance without having to use the transliterations. Probably the most advantageous reason to learn Hebrew is the ability to understand the original author's words, rather than through the translator's opinion of the author's words. Learning the Hebrew language can be both fun and exciting. By simply studying the pages to follow begin building a small vocabulary of Hebrew words and phrases. Unlike English which is read from left to right, Hebrew is read from right to left just as many other semitic languages such as Arabic. This may sound difficult but in a very short time you will get used to it. When sounding out a word it will be easier if you remember the Consonant (C) and Vowel (V) patterns. In English the consonants and vowels may be arranged in any order such as in the word "circle" which has the following pattern; C-V-C-C-C-V. Hebrew on the other hand is very consistent in that a vowel always follows a consonant (except the final consonant which may or may not be followed by a vowel), such as in the following words "Melek" (king) C-V-C-V-C; "Meleko" (his king) C-V-C-V-C-V and "Hamelek" (the king) C-V-C-V-C-V-C. The Yud (Y) is another exception to this as it can be a consonant acting as a vowel, just as our English "Y". English uses the word "Alphabet" which is the first two letters of the Greek Alphabet; Alpha and Beta. Hebrew on the other hand uses "Alephbet" as they are the first two letters of the Hebrew Alephbet; Aleph and Bet. 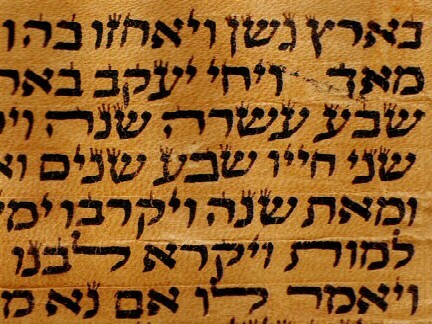 The Hebrew alephbet consists of 22 consonants and no vowels. The vowels are dots and dashes added above and below the consonants. One advantage to Hebrew is that the sound for each letter remains the same unlike English where one has to memorize many variations such as the word circus where one "c" is pronounced like an "S" and the other like a "K". Below is a chart of the Hebrew alephbet as an introduction and these letters will be learned in the accompanying lessons. The first letter is in the upper right hand corner and is read from right to left. Five of the above letters have different form when it appears at the end of word. These letters are called the "final" letters (sophit in Hebrew). Several of the letters in the alephbet are very similar and can easily be confused with other letters. This is very common at the beginning but soon you will be able to make the distinction between these letters without difficulty. Below is a chart with these letters and you may want to refer to this chart on occasion during the lessons. The pronunciation of some of the consonants and vowels have changed over the centuries but this does not affect the meaning of words so we will learn to pronounce them according to the modern Hebrew. Modern Hebrew pronunciation is also divided into two parts, Ashkenazie and Sephardic. Since Sephardic is the pronunciation adopted by the State of Israel, we will also use this pronunciation. In modern Hebrew vowel pointings called "nikkud" (nikkudot in the plural) have been added to words to provide the vowel sounds for each word. The chart below lists these vowel pointings and will be learned in the accompanying Hebrew lessons. These vowel pointings are used in Biblical texts, Prayer books, Hebrew Grammar books and children books but are not normally used in Hebrew writings such as in novels, newspapers, signs, etc. Copyright © TEMPLE RUACH YISRAEL 2019 | All rights reserved.